As temperatures rise and we all enjoy the warmth of the summer sunshine, it is easy to become dehydrated or head-achy. However, as humans it is significantly easier for us to keep cool. We can stay inside, drink extra water, jump into a pool, or cool down next to a fan. But unfortunately, our horses cannot cool down as easily. So, in light of this warning, I have decided to share my tips for keeping your horse cool and hydrated in hot weather. When it is hot outside it’s important your horses have plenty of shaded areas to retreat to when the sun’s warmth becomes too much. Cool areas such as mobile field shelters, trees, and shrubs are particularly beneficial and provide your horses with the protection they need at the hottest times of day. If you’ve been searching for a snack idea that is easy to make and perfect for those hot summer days, ice lollies are for you! Well, technically they’re for your horse. 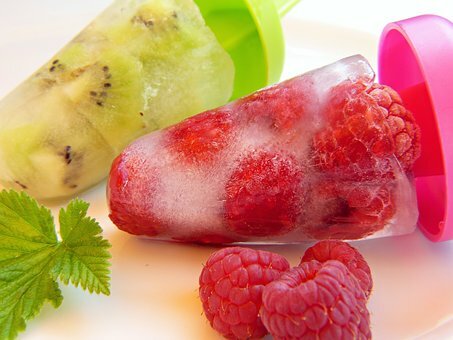 You can make ice lollies from whatever food is normally part of your horse’s diet, such as apples and carrots, and freeze these things in water overnight. Your horse will enjoy licking the ice lolly throughout the afternoon and it will be helpful in keeping him cool. Ice lollies are incredibly easy to make and are a fantastic way to cool down a horse. We’ve probably all played a gamed or two of bobbing apples, but have you ever considered providing a bucket of water and apples for your horse? Bobbing apples is not just a fun bit of entertainment, it is also a great way to give your horse a healthy snack and encourage him to drink more during the day – double bonus! If you’ve never given bobbing apples a go, I would encourage you to try them and see what your horse thinks. Let’s be honest, horses love carrots and apples. So, why not combine them for a cooling summer treat? It’s an easy way to cool your horse down and carrot and apple bites are very simple to make, too. All you need to do is grate one carrot and an apple, then pop the segments into an ice cube tray. You can either top the ice cube tray up with water or spoil your horse with some tasty apple juice. Pop in the freezer and in a couple of hours you will have a dozen delicious summer treats for your horse. Let your horse enjoy them straight after they come out of the freezer as they will melt quickly in the heat! Another great way to keep your horses cool and encourage them to play and have fun is by using the hay string trick. Simply thread string through slices of apple and carrot and freeze. Once fully frozen, remove from the freezer and tie onto a large length of string alongside their paddock. Your horses will enjoy prising the fruit and vegetable pieces of the string and enjoy the refreshing temperature, too. Something most people enjoy on a hot summer’s day are slices of juicy watermelon. This amazing fruit is 90% water, so is one of the best ways to re-hydrate yourself and your horse. Most horses love watermelon and they can also eat the rind – although be sure to serve it up in moderation. Remember that no matter how much you might enjoy giving your horse treats – and no matter how much your horse enjoys receiving them – it is important to do everything in moderation. Too many treats can cause high sugar levels in your horse which can be damaging to their health. So, take it slowly and be aware that while a treat is enjoyable, it’s important not to go overboard. I hope you have found this article useful and that it has given you some good ideas of cool summer snacks to treat your horse with. If you would like to find out more about keeping your horse cool during the summer, call Prime Stables today.